If there is one musical artist that can define my late high school and early college years, it's Ani DiFranco. I discovered her through - no lie - a VH1 countdown of 100 amazing female artists. She was number 80 or so and, in true VH1 style, they played a brief clip of her on stage, mentioned her folk rock roots and the fact that she'd founded her own record label and named it Righteous Babe, then quickly moved on to the next person. I, however, did not move on. The sound of her guitar stayed with me and a few weeks later, when I was looking at CDs in our local Borders, I bought a copy of Not a Pretty Girl with my babysitting money. The rest was history. I listened to that album and her others (it wasn't long before I went back to Borders) with something akin to reverence, memorizing songs and picking apart lyrics. This was the age before the Internet, so I didn't know much about Ani herself, except for what she told me through her music. Lucky for me, she told plenty. Through Ani I learned about feminism, sexism, bisexuality, and abortion. I learned how to be an artist, even when the world is telling you to be something else. I learned that it's okay to be angry, and that it's okay to be happy, too. That you don't have hide your true feelings just to make other people more comfortable. As I said, I discovered Ani DiFranco during a pivotal time in my life, a time when I was figuring out who I was and what I felt and what kind of world I wanted to live in. I grew up in the suburbs of Long Island, with super conservative parents. I was shy, timid, a people pleaser. If it wasn't for Ani, who knows where I would have ended up. Certainly not here, which would be a damn shame - I like it here. 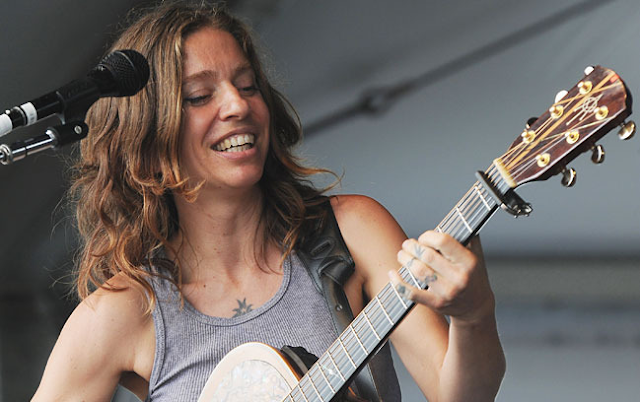 While Ani DiFranco is no longer the constant soundtrack of my life, I still love her and appreciate her. Which is why, when I heard she was coming to Wilmington to play a show at the Brooklyn Arts Center, a beautiful, intimate venue just ten minutes from my house, I bought a ticket immediately. On Friday, after one of the longest and saddest weeks, I headed to the show with some friends. We sipped wine, listened to the opening act, and checked out the crowd, which consisted mostly of starstruck women their 30s (or maybe that was my own reflection in the stained glass windows - it's hard to say). Then, at about 9PM, Ani took the stage. The one and only time I'd seen her previously was in 2001, in New York City, back when we both had dreadlocks. Even though that was fifteen years ago, she looked and sounded just like I remembered, and I felt a familiar thrill. Then she played her first song, and it was "Not a Pretty Girl." Oh, how I love when things come full circle. Over the course of the next hour, Ani played a lot of old favorites from the early days - "Untouchable Face," "Fuel," "Both Hands," "As If," and, my personal favorite, "Gravel." She didn't just sing the songs but reinvented them, so they sounded the same but different. It was almost as if they'd grown up, just like the rest of us. After the show ended and the lights came up, we stepped out into the cold, wet night. I thought about the person I used to be, all the years between then and now. I thought about Ani, the way music, like books, can show you a different path, possibilities you might not have noticed otherwise, and I was grateful all over again.